Real Cool Sites at a Real Good Price! No matter what you’re doing you want the best. When it comes to web sites that’s Internet Man. We have been creating sites longer than anyone. We start with a solid foundation of a Masters Degree in Fine Arts from a top university and marry that with a burning desire to make you the best company on the Internet. That’s an unbeatable combination. And just because we’re the best doesn’t mean we’re big headed. We create web site for less than most. With Internet Man you win on quality and you win on price. Go ahead and call us. Like we said – real cool sites at a real good price. 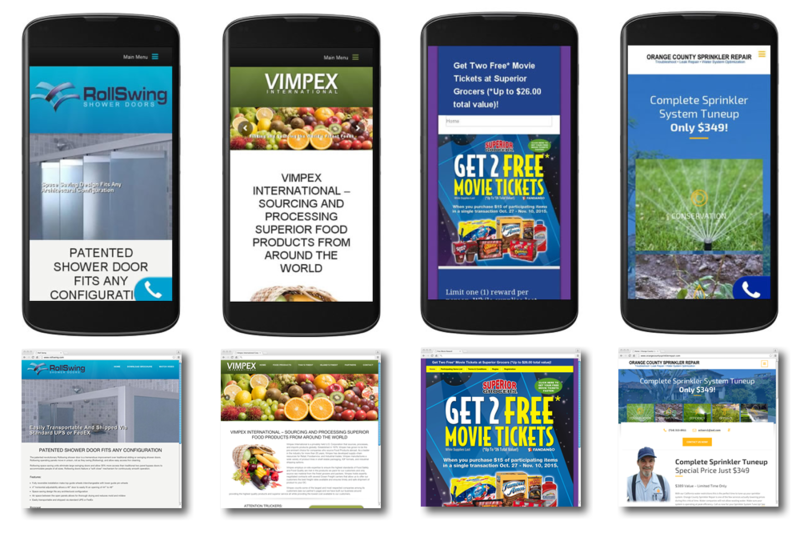 Over Half Your Visitors Are Viewing Your Site On Phones Now! Heads up: desktop viewers are in the minority now. Mobile Internet has increased over 400 percent in the last four years. Internet Man makes sure you look good on the phone. The sites above show the phone layout on top and the corresponding desktop layout below. Phone viewing is critical. At Internet Man we make sure you look great on the phone and just as good on the desktop. The explosion of mobile Internet, coupled with Google’s Mobile Compatibility Test, makes mobile friendly web sites a must. Not having a mobile friendly web site alienates over half your audience. To make matters worse Google kicks you to the curb by not indexing your site. Your mobile presentation comes first and your desktop presentation flows from that. See the “Call Now” button on sites one and four. This little button appears in the lower right on the phones only. Tap the button and the phone automatically dials. Internet Man uses a mobile first approach that can increase calls up to 500 percent. Here’s a look at our mobile friendly website gallery so you can see what I mean. All web designers are aware of the near-free deals out there such as Go Daddy’s One Dollar Per Month Web Sites, WIX free websites, or Web.com free websites. As a business owner that is the stupidest thing you could possibly do. Have you looked at how thin magazines are lately? When was the last time you used a phonebook? Read a newspaper? The marketplace is online now! You better look competent in your marketplace. Trying to save money on web design is a sure-fire way to torpedo your business. My advice: find a professional. If they’re good give them there due. There are tons of web designers and there are tons of free websites but there are few good ones. Good web designers pick up and carry a business. If you have a good designer, that’s great. If you don’t here’s our credentials. Considered us to design your online presence. We can and do take on clients that come from our web site. If you are sitting in the dental chair you don’t want a guy that decided to become a dentist a week ago. It’s the same thing with Web design. You want an experienced designer to manifest your business on the web. There is a tendency in Web design to feel that “hip and young” is fresh. Don’t be fooled by this cavalier approach and the “fru-fru” Web designer’s company name. With a name like Internet Man you know where we stand. We didn’t decide on the Web design career a few weeks ago. We have been in this field for 15 years. Being an artist is a career choice. As such we put the proper credentials in place before embarking on the career. Internet Man (John Mills) holds a Masters Degree in Fine Art from the University of Michigan. Like the dentist we hold the proper degree for Web design. Credentials and experience is an unbeatable combination. We would make a perfect choice for your Web design project. Top quality sites go on top quality servers. Ask you prospective Web designer where they plan to put your site. Chances are they will tell you it doesn’t matter. They tell you that because they don’t have a network. Your site will probably wind up at Go Daddy, or 1and1, or some other low cost hosting service. I’m not knocking these companies but that is like putting your pet in the pound. You are about to be placed on a server with about 300,000 other sites. Response time suffers. You creditability suffers too. Sure you can get by with it but it doesn’t look good. It looks like exactly what it is. Savvy Internet users know. By contrast our hosting network is made up of the finest servers, firewall, and software money can buy. It is hosted on the ultra-fast “Black Fiber” network in downtown Los Angeles. We build our servers from scratch, in house, specifically to run the latest Linux WordPress web sites. It looks like what it is too. It is a fast, exclusive, premium hosting solution for your site. Build your house on a choice piece of property. Most Web designers don’t care what neighborhood you wind up in. We put your site in Beverly Hills. We are very protective over our clients and their sites. By the way, our network has operated continuously for 15 years – essentially since the Internet began. About 95 percent of the Web sites out there are primarily pictures and text. They are essentially product brochures deployed on the Web. That is not a bad thing necessarily. We view Web sites as software. As such our sites are not confined to merely pictures and text. We know a Web site can potentially become an integral part of your business at the software level. For your Web site to enter the software arena you need a Web designer that can write code. All Web designers don’t write code. They present themselves as being able to do everything but they can’t. Installing a plugin is not writing code. Regardless of what they say very few can write code. There’s a misconception about price when it comes to Web design. People think because most things on the Web are free that Web design should be low cost. I’ve run a Web design company. I met payroll for a staff of artists every week for 10 years. Being the owner of a Web design firm is not an easy proposition. If you are lucky enough to hire a good artist you can’t keep them. Why would they work for you when they can free lance at three times the hourly rate? Young people want the most money they can get. As the owner you’re stuck having to give all your money to your employees to try to keep them. You have to give raises or they leave. Add in the cost of an office, insurance, and equipment and you have an untenable situation. I’ve been through all that. It doesn’t work. What you want is the best artist on the staff working on your site personally. That’s me. When you work with Internet Man you’re going to get Internet Man. I do the sites personally. That way I can maintain the quality I want to see. Me doing your site personally is the perfect situation for you. If I’m too busy at the moment I’ll tell you. But once I commit I will deliver the goods. I’ll get your site finished and deployed at a price lower than Web companies carrying an office and staff. I don’t carry the overhead anymore. When it comes to Web design leaner is better. A Web site is not a static piece. At Internet Man we see web sites as ever changing entities. Your Web site is your business on the Web. As your business changes your Web site should change too. We encourage clients to take an active roll in enriching their Web sites. We routinely train clients how to make changes to their Web sites. We do not charge for this. We build visual Web statistics into all our sites. We can see how your site is performing on a daily basis. Monitoring Web site performance creates a synergy with your online presence. We are attempting to go from 20 visitors a day to 200. Making the site relevant does this. We implement ideas that enhance site performance. For example we recently found a phone-button that only shows up when the site is viewed on a smart phone. When you tap the button it dials the phone automatically. Automatic dialing may seem like a small thing but the convenience can close the sale. Isn’t that what a web site is about? We are mature enough to realize that Web sites are about closing sales. We know that if we don’t close sales for you we won’t be around long. If you made it this far chances are you’re pretty serious about Web design. Give us a call. We see things like you do.